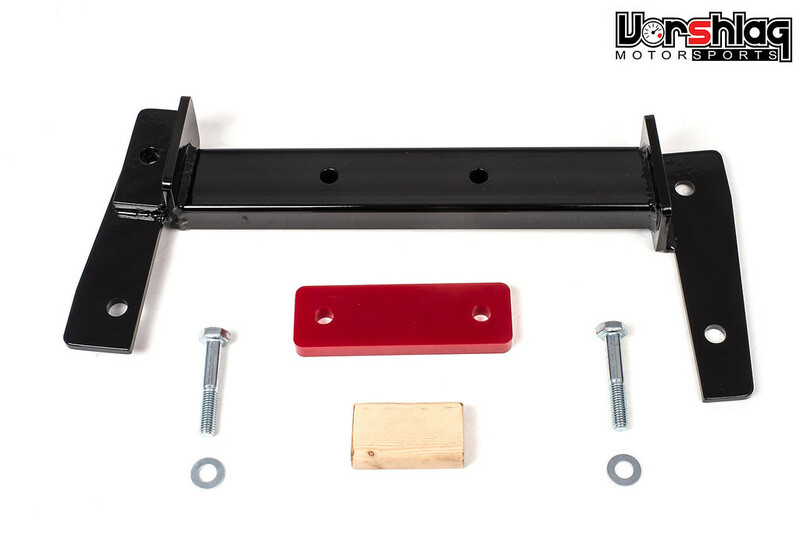 This cart entry is for a red 95A durometer polyurethane bushing (ONLY), which can be used with the Vorshlag E36 or E46 T56 Transmission Crossmember (and is optional in that kit). We created this version of our trans bushing in the Summer 2013, 5 years after creating our first E36 LS1 swap kits. This part is now available separately, by popular demand, for those 80 or so LS1 kits owners we sold before 2013 that came with a harder machined Nylon transmission mount bushing. Initially the Nylon mount was deemed necessary to keep the driveline in check, since the 3" aluminum driveshaft is a snug fit inside the E36 tunnel. But movement proved not to be a concern. Also, making a polyurethane part meant machining a mold to cast it in, which has a big up front cost. By now we've sold so many LS1 kits, and had so many people asking for the poly version, that we went ahead and made it. This version is now optional in the E36 LS1 Stage 0 kits and trans crossmember kit. Red 95A polyurethane bushing to be used with the Vorshlag E36 or E46 T56 Transmission Crossmember. Click on thumbnails for larger image. Note: Vorshlag T56 Transmission Crossmember assembly sold separately.